A plan to preempt Michigan’s counties from adopting policies preventing local law enforcement from cooperating with federal authorities is the latest way the nation’s roiling immigration enforcement debate has hit Michigan. Measures against “sanctuary counties” gained momentum Tuesday in the Legislature after a state House panel sent House Bills 4083 and 4090 to the floor for consideration. Majority Republicans say the legislation is meant to clarify local police and sheriff departments’ roles in federal immigration enforcement. The two bills — called the Local Government Sanctuary Policy Prohibition and County Sanctuary Policy Prohibition acts — would stop local government and counties from enacting or enforcing a law, ordinance, policy or rule that stops law enforcement or other local employees from “communicating or cooperating with appropriate federal officials” regarding someone’s immigration status in Michigan, according to the nonpartisan House Fiscal Agency’s analysis of the legislation. “This simply allows law enforcement a clear framework in which to do their jobs,” said state Rep. Pamela Hornberger (R-Chesterfield Twp. ), who sponsored HB 4083. But Democrats, immigrant rights and civil liberties groups are decrying the plan as racial profiling in the making. A hearing in the House Military, Veterans and Homeland Security Committee boiled over this week as Chair Beau LaFave (R-Iron Mountain), gaveled down a Democrat who compared the preemptions to how southern cities reacted to slavery abolition. He also stopped several speakers who said the bills only create confusion for local law enforcement and would lead to racial profiling. 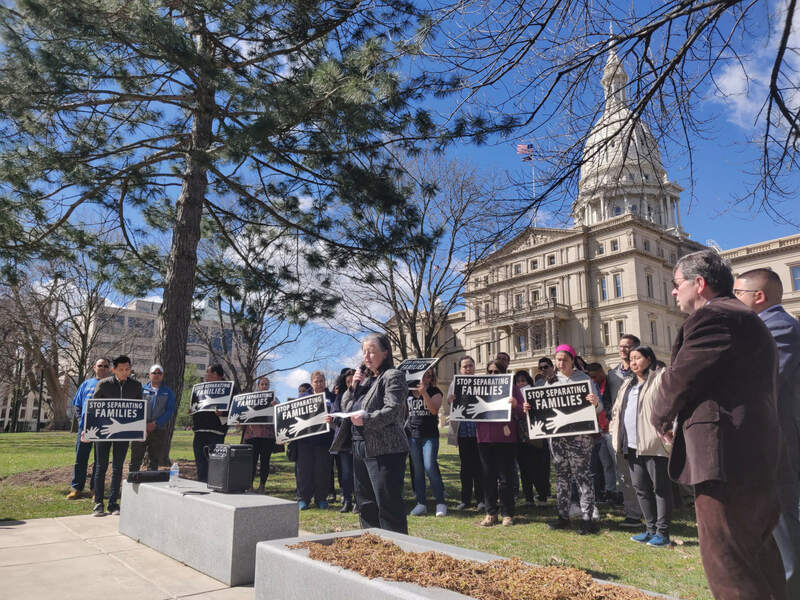 The immigrant rights group Michigan United, the American Civil Liberties Union (ACLU) of Michigan and state Rep. Alex Garza (D-Taylor) all say the two bills could lead to racial profiling. Garza, chair of the Legislative Latino Caucus, also spoke out against the plan at a Michigan United press conference before the committee hearing. Critics also argue it will strain police-community relations and thwart criminal investigations as Latinos grow warier of talking to police out of a fear of deportation. Garza called the legislation a complete “waste of our time,” a sentiment echoed by other Democrats, including state Rep. John Chirkun (D-Roseville), who was interrupted by LaFave’s gaveling after the lawmaker drew an analogy to slavery. “Back in the day when there was slavery, cities passed their own laws, so that allowed them to do that. Some cities did it, some people didn’t. And it was all ruled unconstitutional back after [President] Abe Lincoln won the war,” Chirkun explained to the Michigan Advance after the hearing. “So they told them they couldn’t do it anymore. One of the most intense moments in the hearing came after LaFave interrupted ACLU Michigan Policy Counsel Kimberly Buddin-Crawford during her statement. By Wednesday, House Democrats began issuing formal statements condemning the legislation. The full House will now consider the legislation, which would need the approval of the full House, GOP-led Senate and Democratic Gov. Gretchen Whitmer before becoming law. Ignorant is as ignorant does. Sanctuary is a principle that America was founded upon. ICE agents show up demanding information about persons protected by the Constitution without court order or warrant. They also demand that persons they identify be held in detention by local law enforcement without warrant or court order. Some reports indicate they present false documentation to capture individuals. Just remember conservatives, your next. My dear conservatives, read the US Constitution. “Persons” are granted due process by that document. Current administration policy discriminates against persons by detaining, deporting, separating families; all actions that place local law enforcement, and, by the way all our border patrol agents, in the middle, without lawful authority to do so. And using the gavel in a public committee meeting to deny 1st amendment rights because you don’t know how to listen to a witness is misfeasance. Show the respect that you so falsely claim.